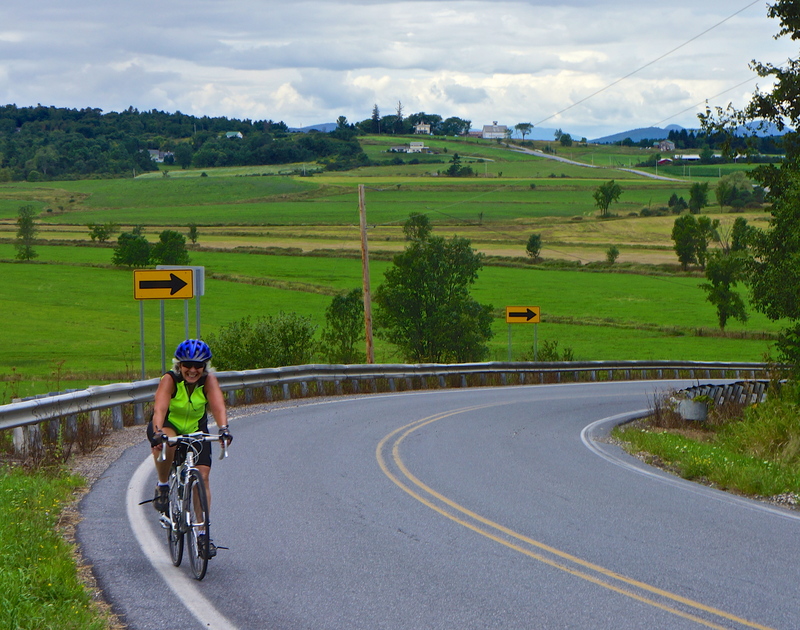 A view of the Vermont bike route with Mollie of Coral Gables, who joined us in Brockport, biking one of the many hills today. You can see the road that led Mollie here in the background. Today I reached a major milestone – I have climbed over 100,000 feet on my bike during the tour! Amazingly, I also continue to evade a flat tire and more often than not – the forecasted rain as I did again today. 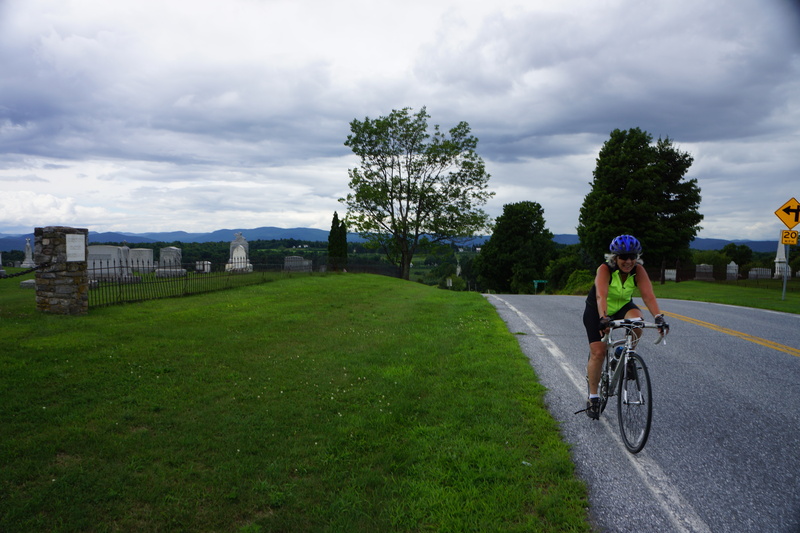 It was with fond memories I biked from Ticonderoga, NY to Middlebury, VT today. 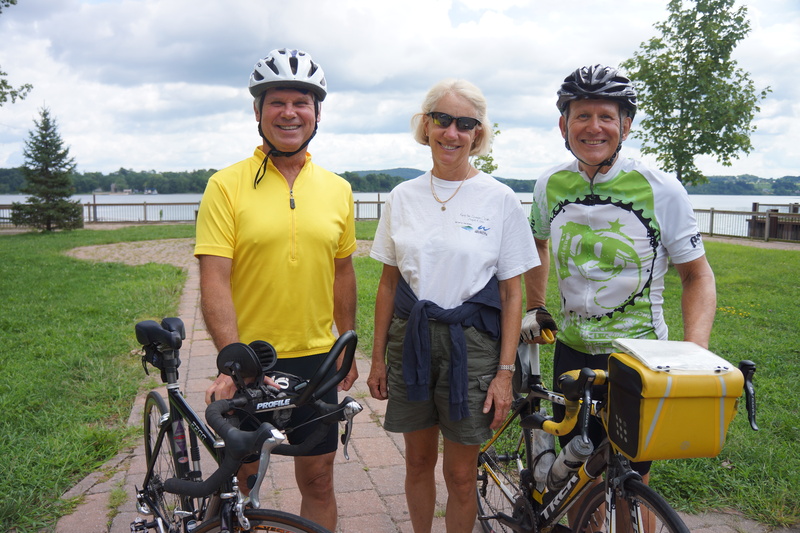 About a year ago, Nancy and I persuaded six friends (Shelley & Eugene, Ted & Kristin, and Mike & Cheryl) to join us on a 6 day bike tour (the 1st bike tour for them) of the Lake Champaign region of Vermont. The last 20 miles of today’s ride including 1) the Kissing Bridge in Ticonderoga where Nancy and I were photographed kissing, 2) the Ticonderoga Ferry, 3) the beautiful ride to Shoreham), and 4) Middlebury, were part of last year’s tour which was great. Even our hotel tonight, the historic Middlebury Inn, was the same hotel we stayed in last year. The only things different were my riding ability (increased), the water flow (decreased) in the Otter Creek in Middlebury (a city we love to visit), and the location of dinner (this year we dined at the Two Brothers Tavern where the food was excellent, but the service was painfully slow). 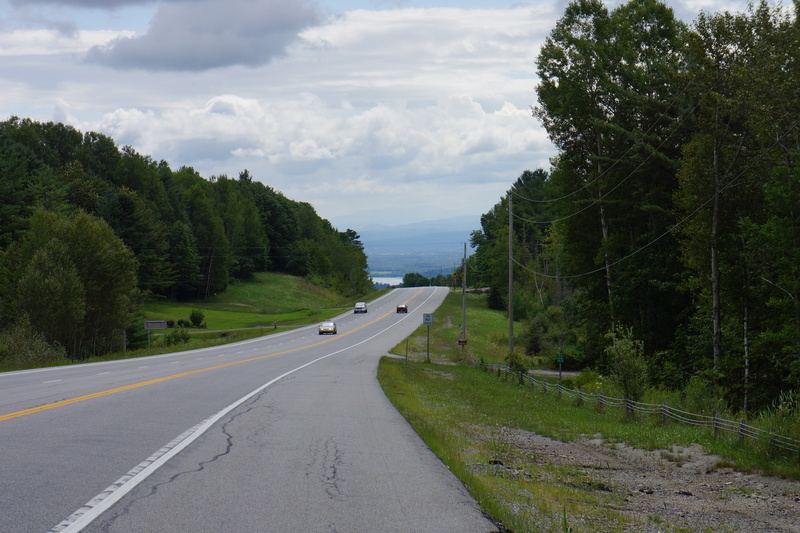 View of Vermont as I begin the long downhill into Ticonderoga, NY. 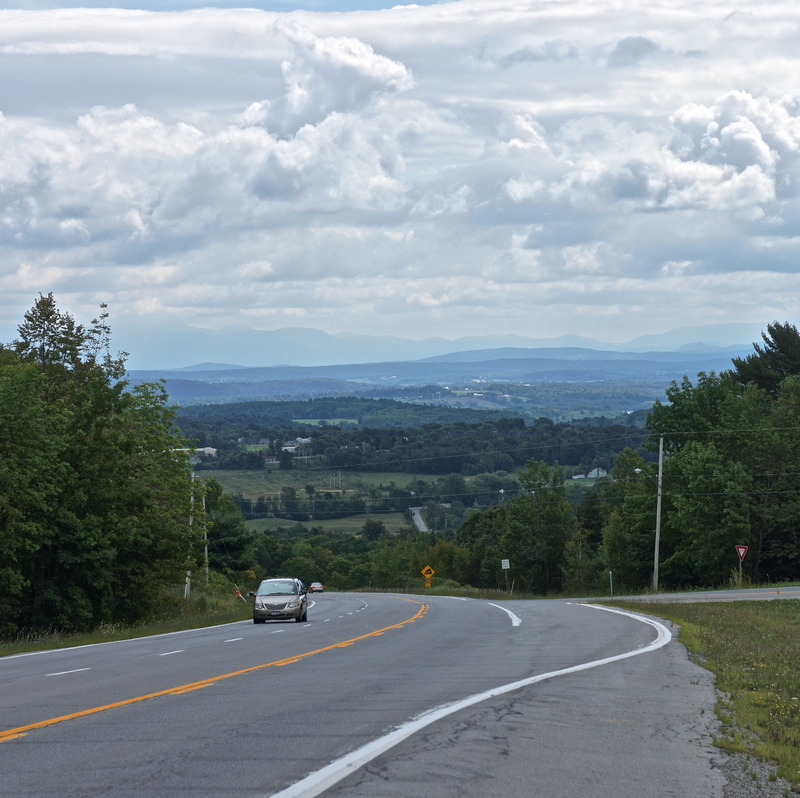 Another view of Vermont from the downhill ride into Ticonderoga, NY. 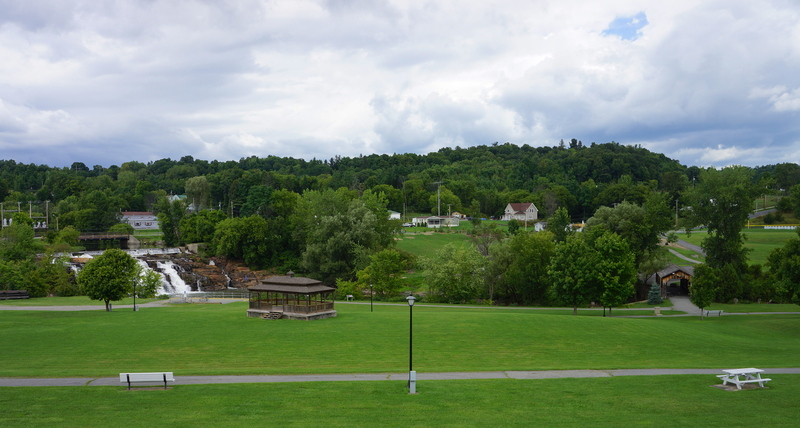 The waterfalls (left) and “Kissing Bridge” (right) in Ticonderoga, which Nancy and I visited last year on our bike tour of Vermont’s lake region with our friends Shelley & Eugene, Ted & Kristin, and Mike & Cheryl. My friend Jim who was summering nearby decided to ride with me for some miles into Vermont from the Ticonderoga Ferry. Pictured above is Jim and bike and his wife Nini as we wait for for the Ferry. 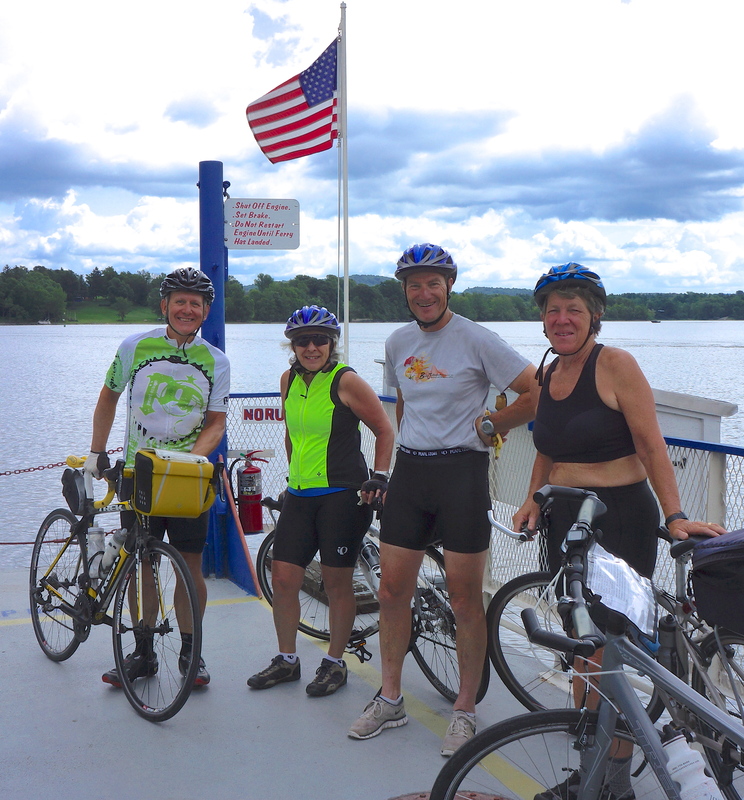 Pictured above with me on the Ticonderoga Ferry into Vermont are three bikers who joined us in Brockport, NY. Left to right next to me are Mollie from Coral Gables, FL, and Steve and Sharon from Los Gatos, CA. 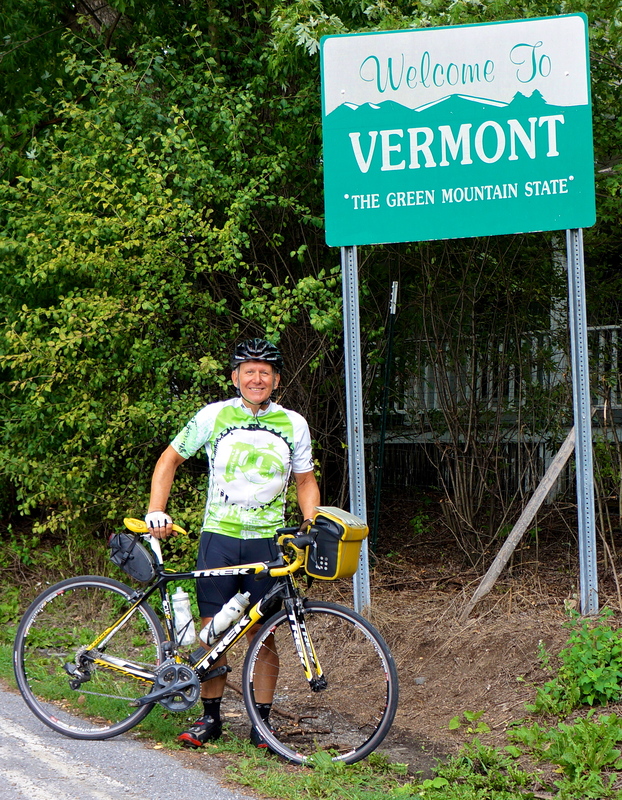 Entering Vermont – only two states to go. Mollie after a long climb from the Ticonderoga Ferry with the New York hills in the background. Mollie after a long climb from the Ticonderoga Ferry with the New York hills in the background and a beautiful hilltop cemetery on both sides of road. 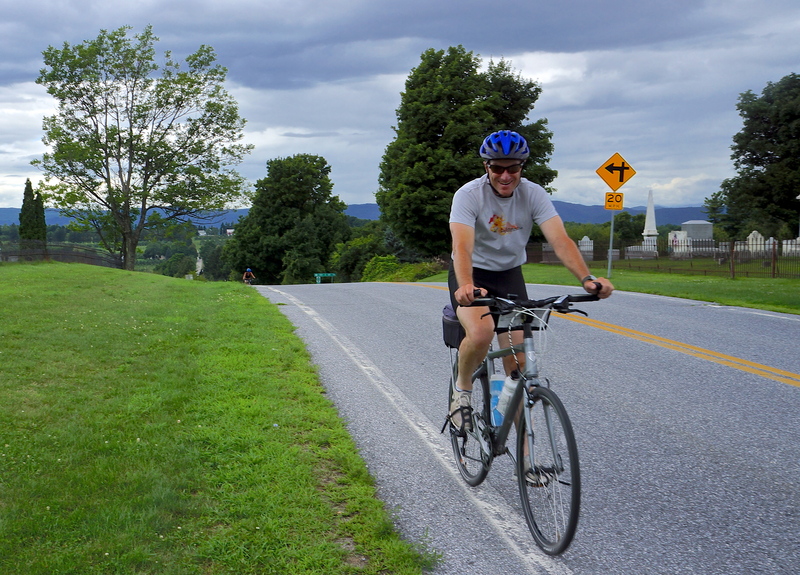 Steve after the long climb from the Ticonderoga Ferry with the New York hills in the background and a beautiful hilltop cemetery on both sides of the road. 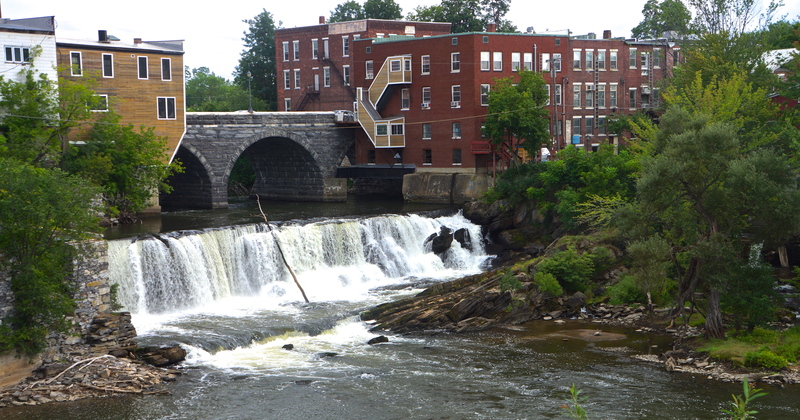 A view of the Vermont as we bike towards MIddlebury, VT.
Pictured above is the Otter Creek Falls in Middlebury. 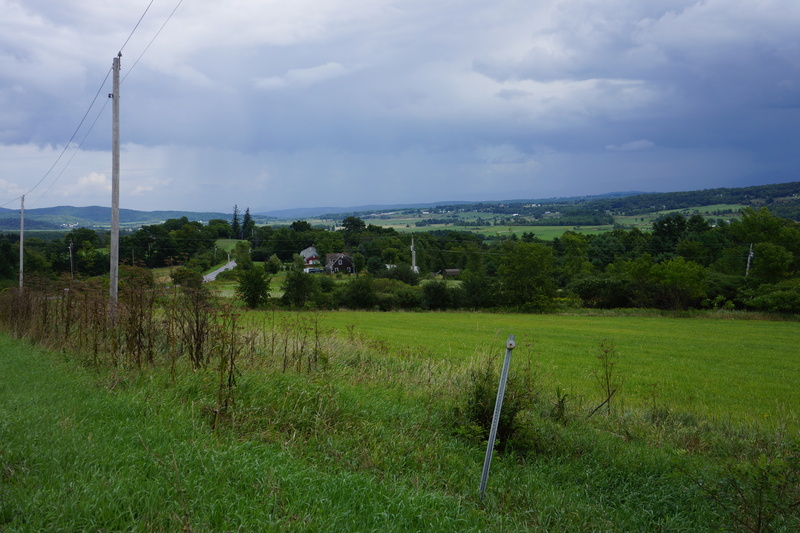 Last year when Nancy I were in Middlebury (which we love) with our friends on a bike trip, Hurricane Irene had just passed. The Otter Creek waterflow last year dwarfs what you see in this photo. I am getting sad that your trip is soon coming to an end. I look forward to reading your blog every day! Maybe you should turn around and go back to the west coast so that you can keep writing. I’m sure that you’ll be able to do trip in half the time since you are now in such good shape! Look forward to seeing you soon. Turning around and doing the trip east to west sounds great – how about joining me? We can ask Teddi and Nancy to drive the SAG wagon or bike together on a tandem and carry our gear. If that is not a good idea (why don’t you ask Teddi first? ), let’s just have dinner soon after I return and plan a bike ride in Chester County (east to west). Hi, Steve. I’m living vicariously through you. I did Glacier National Park last week. The pass I took (Logan Pass/Going To The Sun Road) was just north of your pass (Marius). Beautiful countryside. Looks like you’re winding down your trip. I sure that will be bittersweet. will be with you always. We only wish that we could have been there to see you finish.